2375 Private Albert Trump of the 1/6th Battalion, the Devonshire Regiment. Son of George and Sarah Trump of Cockhill, Berrynarbor; husband of Caroline Pope, formerly Trump; brother of Samuel (below). Born in Prixford near Marwood in the December Quarter of 1888. Died 30 November 1916 aged 28. Made Prisoner of War in Tarsus, Turkey. 40526 Private Arthur J. Snell of the 7th Battalion, the Bedfordshire Regiment. Son of Joseph and Mary Jane Snell of Goosewill, Berrynarbor. Born in Coombe, Hampshire in 1878. Died 12 July 1917 aged 39. Awarded the Military Medal. 60341 Private Albert Latham of the 10th Battalion, the Royal Welsh Fusiliers. Son of Thomas and Eliza Latham of Berrynarbor. Born in Berrynarbor in the September Quarter of 1897. Died 26 September 1917 aged 20. 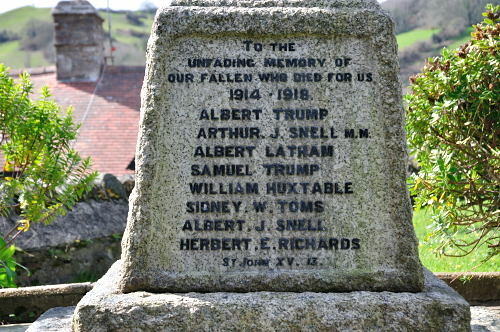 290995 Private Samuel Trump of the 9th Battalion, the Devonshire Regiment. 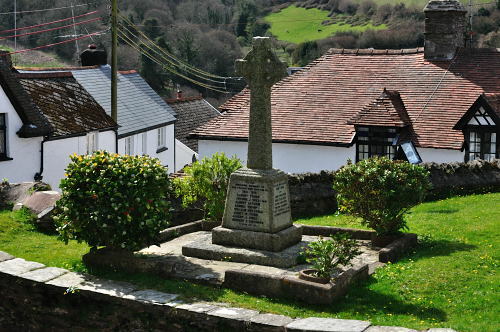 Son of the late George and Sarah Jane Trump of Castle Street, Combe Martin;; brother of Albert (above). Born in Morthoe in the December Quarter of 1895. . Died 26 September 1917 aged 22. 15078 Acting Corporal William Huxtable of the 7th Battalion, the South Wales Borderers. Son of John and Alma Huxtable of Cockhill, Berrynarbor. Born in Berrynarbor in the december Quarter of 1893. Died 6 February 1918 aged 24. 569323 Private Sidney Walter Toms of the 13th Battalion, the Welsh Regiment. Son of John and Mary Toms of Barrynarbor. Born in Berrynarbor in the March Quarter of 1896. Died 31 October 1918 aged 22. Albert J. Snell ("Bert") was a younger brother of Arthur (see above. In 1913, he emigrated to the United States to work as a chauffeur, but when war broke out, he volunteered for service in France with the American Expeditionary Force, serving in the Mechanical Supply Company attached to the 102nd Regiment of the Royal Field Artillery. He was born in Coombe, Hants in 1888 - the date of his death is not yet known. What we do know, is that American losses were extremely high in WW1. 574580 Sapper Herbert Ernest Richards of the Royal Engineers. Son of Benjamin and Mina Richards of Chichester, Berrynarbor. Born in Berrynarbor in the September Quarter of 1894. Died 10 January 1919 aged 25. 208870 Sister Jane Malcolm of Queen Alexandra's Imperial Military Service. Daughter of Napier and Urania Malcolm. Born in London in 1909. Died 1 October 1942 aged 33. The circumstances of her death are not yet known. She was buried in the Moascar Cemetery in Egypt which was created to take war casualties from the garrison in the Canal Zone. 788653 Flight Sergeant Jaroslav ("Erik") Zapletal of the RAF VR, 311 (Czech) Squadron. Died 1 January 1945 aged 33. Buried in Berrynarbor Cemetery. On New Years Day 1945, Liberator FL949 (PP-Y) took off from RAF Tain with a fresh Czech crew—all members of the RAF VR. The aircraft was scheduled to fly north from Tain in Rosshire, passing over Wick on the Scottish mainland. The Liberator was on anti-submarine patrol duties. Apparently unaware of the high ground ahead, the Liberator flew straight into the steep cliffs at the northen end of Hoy. 224056 Lieutenant Peter Meadows of the 7th Battalion, the Royal Tank Regiment. Son of Sidney and Mylene Meadows of Berrynarbor; brother of Trevor (see below). Born in 1922. Died 1 July 1944 aged 22. 42317 Flt/Lieut. Trevor Sidney Francis Meadows of the RAF, 29 Squadron. Son of Sidney Clarence and Mylcie Meadows of Berrynarbor; brother of Peter (see above). 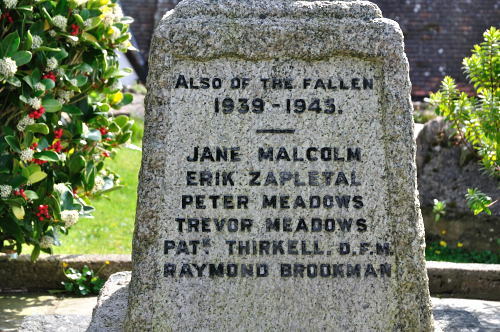 husband of Imelda Meadows, of Pieta, Malta, G.C. Died 23 September 1944 aged 26. Flight Lieut. Meadows went missing 23 September 1944 along with his navigator Flying Officer Ronald Brown of the RNZ Air Force on a flight from Hunsdon. Their plane, Mosquito NF X111 HK517, was brought down in a farmer's field at Wiesede. The Luftwaffe recovered two bodies and arranged their burial but no grave has ever been found. 905398 Flight Sergeant Patrick Herbert Harold Thirkell DFM. Born in Berrynarbor in the June Quarter of 1918. Died 8 May 1942 aged 24. Seven Lancasters of 44 Squadron took part on a raid on the Heinkel Factory at Warnemunde. The target was heavily defended by search-lights and flak. Four of the Lancasters were lost on the raid. Wing Commander P. W. Lynch-Blosse only took command of 44 Squadron that night but was killed a few hours later in the raid. D/JX 153477 Able Seaman of the Royal, HMS Glorious. Son of Francis William and Rosina Brookman of Berrynarbor. Born in Chippenham, Wilts in the June Quarter of 1921. Died 8 June 1940 aged 19. HMS Glorious was an aircraft carrier with a crew numbered in the hundreds. There were just two survivors - both were picked up by German aircraft - Able Seaman Roger Hooke was repatriated in 1943 but |Ordinary Seaman Roger Jones died of wounds on July 1 1940.